Lake Tekapo is the base for our activities. Lake Tekapo is a delightful lakeside resort nestled amongst some of New Zealand’s most beautiful mountain scenery. Well-known for the turquoise colour of the lake and the Church of Good Shepherd. The place is renowned for clean air and clear skies. Lake Tekapo - Relax and love it! Following activities are available in Lake Tekapo: walking, trekking, mountain biking, horse trekking, golf, fishing, scenic flights, star watching, hotpools, wellness, inline skating, summer tubing. Stargazing tours. Winter activities (from end of June, until middle of September) include alpine and nordic skiing, ski touring, heli-skiing, ice skating,winter tubing, hotpools, wellness. Stargazing tours. Accommodation during the hunting trips is specifically selected, so that we are based as close as possible to the animals. According to the different requirements of the guests, the animal situation, the climatic conditions etc., we either stay at , in farm cottages, in musterer huts or in tents. in Lake Tekapo, our family home and Boutique Motel is the base for our operation. A very popular accommodation with six individually designed apartments, situated close to the lakeshore. offers comfortable accommodation in a quiet area and great scenery. Farm Cottages are small houses on working farms. They have electricity, warm water, shower, flush toilets, and different bedrooms with beds or bunk beds. Bedding may be provided or we use sleeping bags. 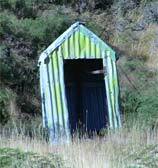 Musterer Huts provide accommodation in remote backcountry areas. The huts have open fireplaces, bunk beds, etc. Sleeping bags will be used. The huts we use are basic, but clean and functional; toilets are the "little house in the prairie"; some huts are a bit more "luxurious" with running water and showers. Tents are specifically designed for mountain conditions. They are spacious and of very good quality, offering a comfortable camping experience. Tent camps are normally set up in the middle of good hunting areas, surrounded by beautiful landscapes with stunning views.